George Graham reviews International Orange's "A Man and His Dog"
We have another jam band for our review this week. As noted previously in this series, the improvisational groups come in various configurations, sets of influences, and degrees of musical sophistication. Some are jazzy, some have some bluegrass influence, some create really interesting arrangements, with distinctive instrumentation, or play with a particularly high level of musicianship, while others get together and jam on a couple of rock chords. This week’s band’s orientation tends toward the sophisticated arrangement end of things, with strong musicianship, but also a kind of light-heartedness in the music that keeps it from being too heavy-sounding. 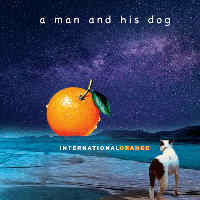 The band is called International Orange, and their new release is called A Man and His Dog. Based in New York, International Orange was founded by guitarist David Phelps and drummer Todd Isler. Phelps has long played fusion and some jazz as a member of the 11-piece ensemble led by Peter Apfelbaum, Hieroglyphics. Isler has been on the New York scene for some 20 years, performing in a number of world music and jazz ensembles, studying percussion and touring in Africa and India. Phelps and Isler released the first International Orange album in 2013, with bassist Gaku Takanashi and keyboard man Dan Stein. International Orange began recording the all-instrumental A Man and His Dog in 2016, with their original personnel. But in January 2017, Takanashi died suddenly of a brain aneurysm. Recording resumed in June of 2018 with bassist Leo Traversa and keyboard man Adam Morrison. So the album consists of two sets of sessions, two years apart with half the personnel changed. But it sounds surprisingly coherent from one piece to the next, and the album is arranged with the tracks mostly alternating between the different sessions and line-ups. International Orange’s music features a high level of musicianship, but it’s not a band to be ostentatious in that respect. Their compositions often get into tricky rhythms, with some occasional hints of world music, but they also get into some funk grooves. And the tunes, as expected, have opportunities for solos. The band’s instrumentation is rather conventional, with guitars, keyboards, bass and drums, with Isler occasionally bringing in more exotic percussion instruments. Guitarist Phelps often plays slide style, evoking Southern rock or blues, which is something one does not often hear in this jazz-rock fusion setting. A Man and His Dog, the new release by the Brooklyn-based fusion quartet and jam band International Orange, is a first-rate album that combines excellent musicianship with creative compositions and arrangements. Though the recording consists of music from two sets of sessions two years apart, and with half the personnel different, the sound is nevertheless consistent. The album covers a nice variety or influences, and it’s all quite tasteful, and not showy. The group, by the way, decided upon their name one day in their favorite bagel joint in Brooklyn, reading on a Snapple cap that had a piece of trivia that the color of the Golden Gate Bridge in San Francisco was “international orange,” designed for its visibility in the aerospace world. Our grade for sound quality is a “B.” Some of the instruments including drums sound overdriven, especially on the material from the 2016 session. And use of compression to make the recording artificially loud is heavy-handed and spoils some of the subtlety of the performance. While the golden age of the jam band may have been about 15 years ago, the genre is still alive and well, and International Orange’s new album is an impressive example.